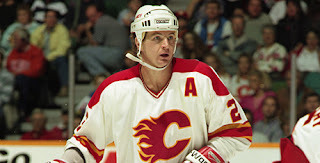 Al MacInnis will be inducted to the Hockey Hall of Fame on 12 November 2007, along with Mark Messier, Ron Francis, and Scott Stevens. The 2007 HOF class is very impressive, probably the most decorated inductees ever. I rode about half way up Via Del Monte in Rancho Palos Verdes. Above is the view. Actually, I jacked this image from the internet, but this is pretty much the view. I should really get my own digital camera for situations like this. Any ideas of what to get? I love munching on Pringles. The chips remind me of the Calgary Saddledome, and you all know I love them Calgary Flames. The Saddledome in Calgary is of course the home of the Calgary Flames. It was built to host the 1988 Winter Olympics and was know as the Olympic Saddledome for the first 15 years or so. In 1996, it was renamed the Canadian Airlines Saddledome, a lot of the locals disliked the omission of the Olympic from its name. 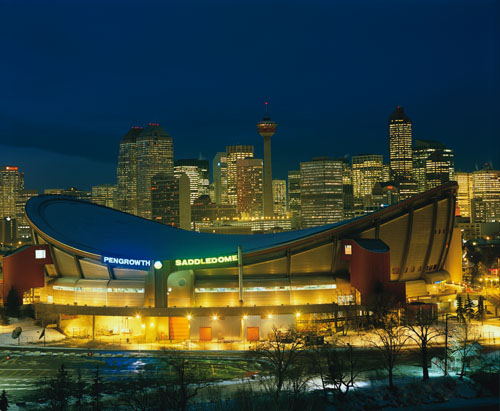 Since 2000, it has been known as the Pengrowth Saddledome. I think Pringles should buy the rights to the Saddledome. They could reinstate the Olympic moniker, and call it the Olympic Pringledome! Random thought: If your hand gets stuck in the tube while reaching for those last few chips...it is time for you to stop eating so much junk food. Rose Bowl, Pasadena, California, 18 June 1988. No, I was not there. But I must have heard Depeche Mode's 101 album...oh, about 101 times! I have seen the film, 101, a few times, too. I just realized something....I am a total geek!!! 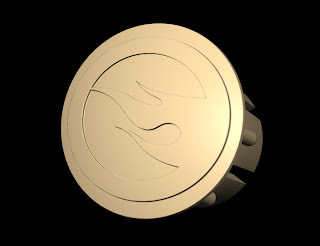 Finally, screen shot of the end caps I made using Freeform. I made these a few weeks ago, just have not had the time to take pictures of the print outs so screen shot will have to do for now. I put a Hot Wheels logo on it, because I can. I just got back from my cousin's wedding. Yeah, I look pretty good in a suit, I should be a model...a "before" model. Kinda tired after driving all day. In a nutshell, I saw aunts and uncles I have not seen in 18 YEARS!!! Also saw cousins I have not seen since 1989 (that is when Calgary won the Stanley Cup). There was a great surprise as one cousin, whom I have never seen, also showed up. This was the first time my dad and his three sisters and two brothers were together since 1996. Dad's siblings, above L to R: Cheung Jing Yee - Second oldest sister (third oldest sibling) , Milton Kwan Yee Cheung- my dad (he is the oldest), Thuy Nguyen- bride and Newman Yat Hin Cheung - groom (my cousin), Cheung Kwan Man - second oldest brother (father of the groom, fifth oldest), Cheung Sok Han - oldest sister (second oldest), Cheung Wing Yee - youngest sister (fourth oldest), and Gary Kwan Wing Cheung - youngest sibling. My aunt from Hong Kong and her husband, Wong Kwok Yan. Originally from HK, now living in Toronto: My uncle Gary Cheung, his wife Lancia, and their son Eric Cheung. I will post more pictures later, as soon as I get some from my cousins. It was great to see all my family again. Amazingly, I they all look pretty much the same as I remembered. There are four more cousins, also from HK and Toronto, that did not make it. I hope someday soon there will be one huge reunion...hey, maybe in November. I guess they could do it in five games. At least I got to see the cup winning game. I thought the Ducks should have won it in 2003. Get this, for the third year in a row, a Canadian team reached the final and failed to bring the Cup home to Canada. Oh well. Congratulations to the Anaheim Ducks, go Flames! I just realized that I will be out of town for Game 6 of the Stanley Cup Finals. This means if the cup is won on Saturday, 9 June (by th way, it is also Johnny Depp, Natalie Portman, and Michael J. Fox's birthday that day), I will miss it. I have to go to yet another wedding that day. At least Rich and Juliet did the right thing by not scheduling their wedding during the finals, thanks guys, I do not think John or I would have made it otherwise (I am serious, just kidding...no, serious). Would it be rude for me to bring a portable TV to the wedding??? I mean, this is the Stanley Cup we are talking about. If it was my wedding, 1) I would not schedule it during the playoffs. 2) if I did, there would be a big TV there with wedding ceremony following the Cup presentation. I will be ditching work early tomorrow and Wednesday for Games 4 & 5. I think my boss will understand if I take a "personal day". Again, I am a total geek. Go Ducks and/or Senators...just take it to seven.